Between Cheryl and me, we have 10 nieces and nephews. Eighty per cent of them are boys. So, each year we set out to find out what they want. Because we are no longer spring chickens ourselves, trying to keep up with current trends for a group of teenagers (ages 13-22) is filled with some challenges. Cheryl asked her nephews what they wanted via text messages. While one responded with an itemized list, the others were vaguer. So, Cheryl threatened that if you do not give me at least some ideas, you will get just socks and underwear. Needless to say, she got some feedback. But the feedback she didn’t expect was from Grant who stated, “Actually, socks and underwear is a good idea.” Ha. You realize that they are growing up when that is their response. Regardless, we enjoy shopping for them. Trying to find the right gift to get that heart-felt hug, you know the one that they really mean. Not the forced one that I impose. Ha-ha…it is one of the joys of being an Aunt. So, I guess this post should have some genealogy in it to make it official. I thought it would be a good time to pick an ancestor that had a birthday in December. 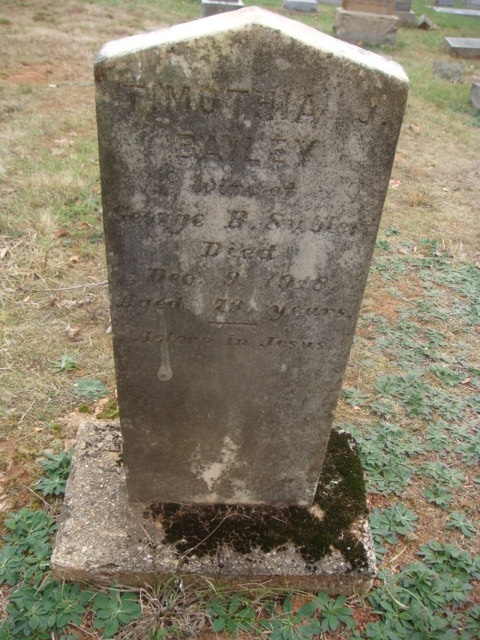 While I was looking, I stumbled onto Timotheus Jane Bailey. She is my 2nd Great Grandmother. In other words, she was my great-grandfather John Thomas Sublett’s mother. Her name appears most often as Timotheus. But on her tombstone it is written Timothia. Timotheus was born 7 December 1845. This is actually one day before my birthday. She was born to Yancey Bailey and Mary Marshall Cobbs. The family had 14-15 children. President James Polk, the 11th President of the United States had just started his presidential term. Texas becomes the 28th State. In the 1850 Federal Census, she was living with her parents and siblings on a Farm in Campbell County, Virginia. In the 1860 Census (Eastern District), Timotheus was 16 years old. The Bailey family was living on a farm in Campbell County. The value of real estate was listed as $2013 dollars and the Value of her father’s Personal Estate was $5580. So, I am unsure how or when they met. However, according to an undocumented source, I have George and Timotheus marrying on 18 Jan 1867. I will have to find the source. By the 1870 Census (Eastern District), Timotheus was 23 years old. She is married to George Bland Sublett living on a farm with his parents William J Sublett and Sarah, Timotheus also has 2 children, Ida (born 1868) and Emma (born 1869). In the 1880 US Federal Census, Timotheus was keeping home raising her children. At this point she had 7 children. They are living on a farm in Falling River East (Enumeration District 41), Campbell County. In the 1900 US Federal Census (ED 22), Timotheus and George are living with her daughter Ida and her family. My great-grandfather John Thomas is also listed as living there. This document contains vital information because it asks the persons whether they were married or not and how many years married. Timotheus and George indicate that they had been married 36 years. So, it puts their marriage date in 1864 or 1865. Timotheus died on 9 December 1918, two days after her 73rd birthday. She is buried in Gladys, Virginia. 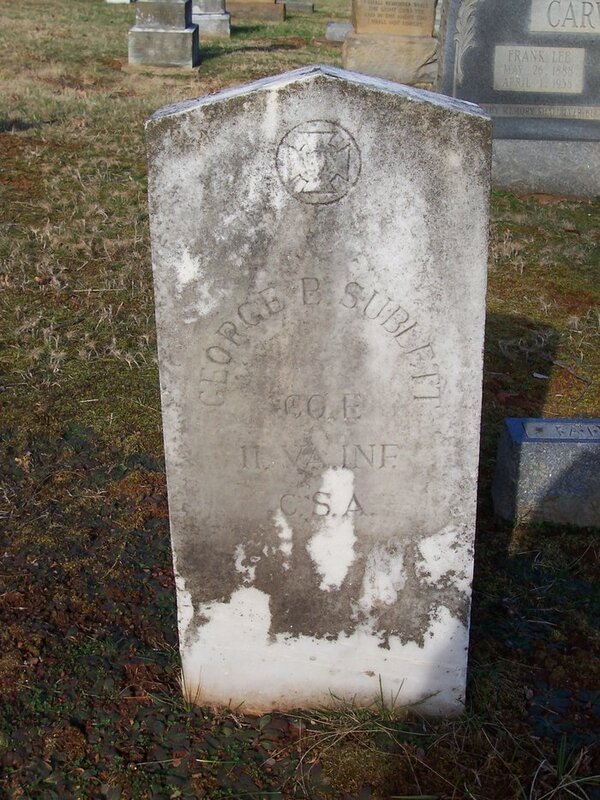 George Bland Sublett was my 2nd great-grandfather. He was born to William J. Sublett and Sarah Hammersley on 14 October 1847 in Nottoway, Virginia. If you are reading this, you are probably wondering where is Nottoway. I was too, so I had to look it up. It is located about an hour southwest of Richmond, Virginia. It turns out that it was initially inhabited by the Nadawa Indian tribe. The name was later changed to Nottoway (source: http://www.nottoway.org/history.shtml). According to the 1850 Census, George lived with his parents and siblings, Matthew, James and Melinda in Dinwiddie, Virginia. This is about 35 miles due east of Nottoway. By the 1860 Census, the family moved again. They are now living in Campbell County. This is about 103 miles northwest. George’s father is listed as owning property valued at $975 dollars. George’s sister is still living at home, but the older boys Matthew and James are not. George is 13 years old. In 1861, the War between the States begins. In 1864, George enlists in Company E, of the 11th Infantry Regiment of Virginia. George later becomes a Prisoner of War having been captured at Five Forks on 2 April 1865. George was subsequently released on 20 June 1865. I am unsure how long he remained enlisted. I haven’t been able to find any documents. After the war, he marries Timeotheous Jane Bailey about 1867. By 1870 the US Census comes around again. He is 22 years old, living back home with his parents, his wife and two daughters, Ida and Emma. There is also a young black boy named William Jones, age 10 living at the residence listed as a nurse. I am unclear what that means. George and Timotheus go on to have 5 more children, William Yancey Sublett, Leila Mitt Sublett, Mattie D. Sublett, John Thomas Sublett (my great-grandfather) and Mary E. Sublett. There is a lot more to share about George, but we will both have to wait for a later time. I will have to remember to tell you about this headstone. John Thomas Sublett was my great-grandfather. He was born 20 August 1877 in Campbell County, Virginia. John Thomas was the sixth child of seven born to George Bland Sublett and Timotheus Jane Bailey. According to the 1880 US Census, they were living in Falling River, Campbell County. His father George was listed as a farmer. By 1900 however, John Thomas (age 22) and his parents George and Timotheus are living with his sister Ida Sublett Dyer and her family. 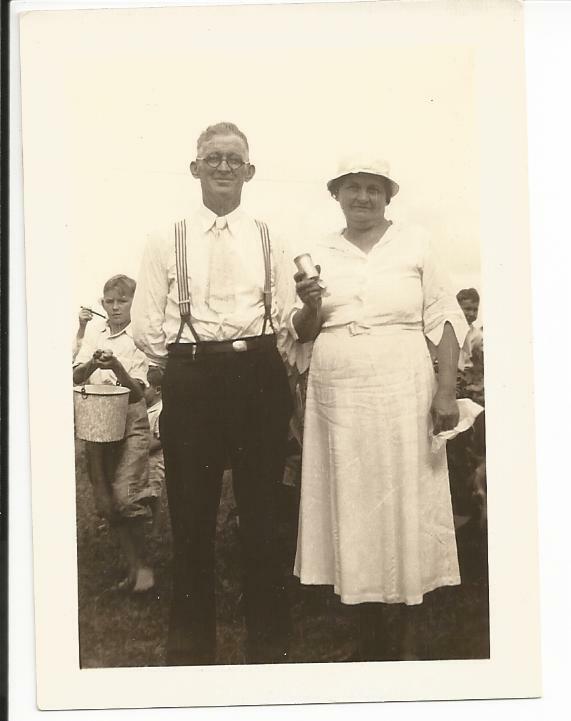 Ida’s husband Tom Dyer, is listed as owning a farm. By the 1910 Census, John Thomas “JT” is now listed as married and living with his family in Falling River, Campbell County, Virginia. His wife, Georgia Kate Holt are listed as have been married for 9 years. This would estimate their marriage about 1901. Claudia, Anne, and Lacy all show up on this census. JT is listed as a farmer renting his land. 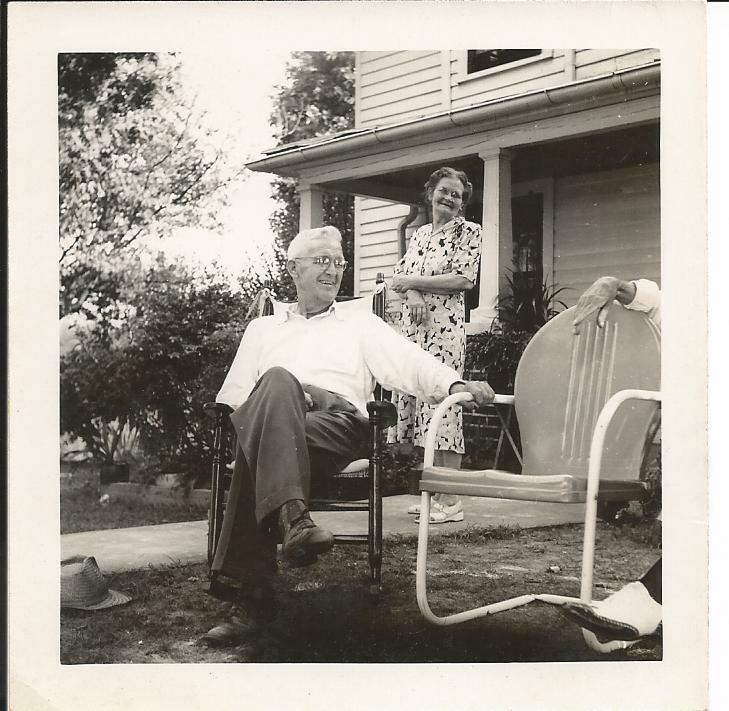 The 1920 Census, JT and his wife are still living in Falling River Campbell County. Claudia, Anne, Lacy and Mae are listed as well. JT’s father George Bland is listed as a widow and is living with them. According to the 1930’s census, JT is listed as a Foreman for the State Highway. Georgia is there raising the last two girls, Mae and Clarice. Georgia’s mother now resides with them (Sue Holt). They also list Ralph Dudley (Boarder). This census asks the participants the age at first marriage. JT (25) and Georgia (17). The 1940 census was just released this year. According to it, JT is a maintenance patrolman for the Highway Department. JT and his wife, list his nephew Fred Sublett and Georgia’s mother Sue Holt as residing within the home. We also know for certain that they live and own the Naruna home (13 County Road 605, Naruna). Fred Sublett is listed as the Farm laborer. It is probably safe to assume that he was running the farm. I will post more about JT at a later post. I just wanted to get his timeline down.